Jacob Appelbaum says that a number of Tor's development projects are inspired by the needs of the people that Tor works with around the world. Many of these people are working on the front lines of human rights and political activism. "This is all a team effort - many of our prototypes go on to become full fledged projects. The people involved in the Tor Project are spread across the world and put in an amazing amount of effort." Both Appelbaum and Tor co-founder Roger Dingledine have taught activists around the world to use Tor. An an example, in Tunisia, they taught people to use encryption tools as part of a larger strategy. The tools themselves are part of a way of thinking about not only security and technology but also about operational security issues more generally. The tactics required to resist mass surveillance, targeted surveillance and repression generally are not merely technical: they are also social, economic and political. Appelbaum and colleagues have also worked with hundreds of people from around the globe who are fighting for basic human rights in their respective countries, including lawyers, politicians, human rights activists, technologists, medical doctors, journalists and academics. The stakes are sometimes high - many people they have worked with are in danger through extreme surveillance because of their work, and for some, learning to use anonymity and encryption tools like Tor could literally save their lives. Appelbaum goes on to add, "The Tor Project is very lucky to have such a passionate community of developers, relay operators, and volunteers. So much of what we do depends on the generosity of our surrounding community that I am often humbled by their accomplishments. I look forward to campaigns like this one helping to create a more sustainable Tor, so that we can better support and honor the contributions and hard work of everyone involved." 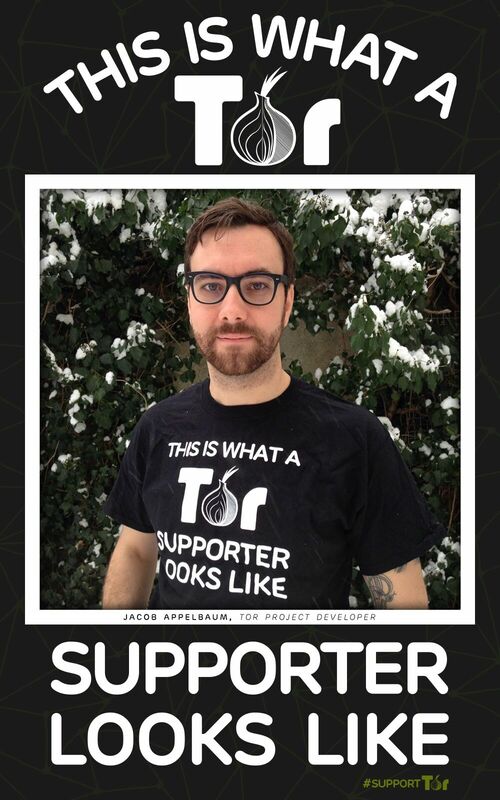 Please join Jacob in supporting the Tor Project today! is it possible to redirect/open all these hidden functions in the intel chipset (not used or abandoned) and to run tor in an invisible/including area of the hardware ? do i need an encrypted driver for my keyboard (laptop & pc question) ? Gracias al `proyecto TOR de cifrado en COLOMBIA permanecemos vivos periodistas, politicos y activistas, ventilamos la accion PARAMILITAR DE ALVARO URIBE VELEZ. Jacob you don't me know, but I know you are an absolute legend. Big respect to you and your strength, committment, courage and heart. Just a hunch? Everytime I use the Tor browser and VPN and visit a darksite\markets I have to recovery my system because the Internet connection won't connect after I logoff. I noticed funny Captcha before this happens too. I have a hunch whats happening because the 1st catastrophic system crash occurred for no reason and looked like something only the FEDs could pull off? My McAfee and Karpasky were also disabled and now it just slips right past it. I can use my VPN minus TOR forever but once I load Tor and after about three searches the Captcha's start and I know I'll have to restore my system for the internet to connect? Anybody else having this issue? Actually, it sounds to me like your VPN software is screwing things up for you.